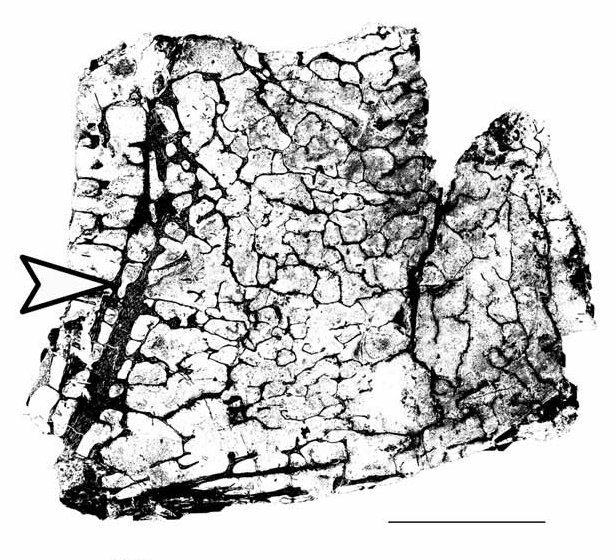 A section of the cotyle of a presacral vertebra of Alamosaurus (Woodward and Lehman 2009:fig. 6A). The arrow will be explained in a future post! Last year was good for sauropod pneumaticity. In the past few months we’ve had the publication of the first FEA of pneumatic sauropod vertebrae by Schwarz-Wings et al (2009), as well as a substantial section on pneumaticity in the big Alamosaurus histology paper by Woodward and Lehman (2009). I won’t repeat here everything that Woodward and Lehman have to say about pneumaticity, I just want to draw attention to a little piece of it. Their work is observant, up-to-date, and worth reading, so if you can get access to the paper, read it. How does degree of pneumatisation vary between individuals? Here are three more: how does it vary along the neck, how does it vary long the length of an individual vertebra, and how does it vary through ontogeny? Then of course there is variation between taxa across the tree. So what we have here is a five-and-half-dimensional space that we want to fill with observations so that we can start to deduce conclusions. Trouble is, there are, so far, 22 published observations (neatly summarised by Wedel 2005:table 7.2), which is not really enough to let us map out 5.5-space! That’s one reason why, at the moment, each observation is valuable — it adds 4% to the total knowledge in the world. Digital images of sections of vertebrae and ribs were imported into ArcGIS 8.1 (Dangermond, 2001; for methods see Woodward, 2005). A unitless value for the total area of the image was calculated, using the outline of the bone as a perimeter. Subtracted from this was the area value taken up by bone, as determined by color differences (lighter areas are camellate cavities, darker areas are bone). Using this method, longitudinal sections of centra are estimated to be roughly 65% air filled. The amount of open space similarly calculated for the pneumatic proximal and medial rib sections is about 52%, whereas the cancellous spongiosa in distal rib transverse sections yields an average estimate of about 44% of their cross sectional area. Hence, the camellate cavities result in an appreciably lower bone volume compared to spongiosa. Pneumatic Alamosaurus vertebrae – ASP of 0.65, density of 0.63 g/cm^3. Pneumatic Alamosaurus ribs – ASP of 0.52, density of 0.86 g/cm^3. Apneumatic Alamosaurus ribs – MSP (marrow space proportion) of 0.44, density of 1.43 g/cm^3. Pneumatic bird long bones – ASP of 0.59, density of 0.74 g/cm^3. Apneumatic bird long bones – MSP of 0.42, density of 1.44 g/cm^3. Apneumatic mammal long bones – MSP of 0.28, density of 1.63 g/cm^3. ASPs and MSPs of bird and mammal bones are calculated from K values reported by Cubo and Casinos (2000) for birds and Currey and Alexander (1985) for mammals. I don’t know what the in vivo density of sauropod compact bone was; changing it from the avian value of 1.8 to the mammalian value of 1.9 would have a negligible effect on the outcome. The apneumatic ribs of Alamosaurus were more similar in density to apneumatic bird bones than to apneumatic mammal bones. In both birds and Alamosaurus, pneumatization reduces the amount of bone tissue present by 15-30% in the same elements (long bones for birds, ribs for Alamosaurus). Pneumatic bones are light not just because the marrow is replaced by air, but because there is less bone tissue than in apneumatic bones, as bird people have been observing for ages. There’s loads more work to be done on this sort of thing, so I’m going to stop blogging now and get back to it. Stay tuned! Is the difference in bone density ‘tween mammals and birds indicative of anything? Is, say, mammal bone stronger? One would think. I got the 1.8 number from a table in Spector, W.S. 1956. Handbook of Biological Data. WB Saunders, Philadelphia. Most sources give 1.9 as the density of mammalian compact bone, and some go as high as 2.0. Birds have smaller osteocytes than mammals and hence smaller lacunae, so all else being equal their compact bone should be slightly denser. Clearly all else is not equal. Whether the 0.1 g/cm^3 difference affects bone strength to a noticeable degree I have no idea. Maybe some lurking biomechanist will pipe up and tell us. Ah, sorry. Apneumatic just means ‘not pneumatic’. As applied to bones, it means marrow-filled. A somewhat inelegant term we air-heads use to refer to what most folks would just consider regular old bones. Hmm. I just read about a paper describing the bend stresses in bat wings during flight. It would be interesting to see a comparison with bird bones. The arrow will be explained in a future post! Wow! So early humans WERE contemporaneous with sauropods! And.. HUNTED them!